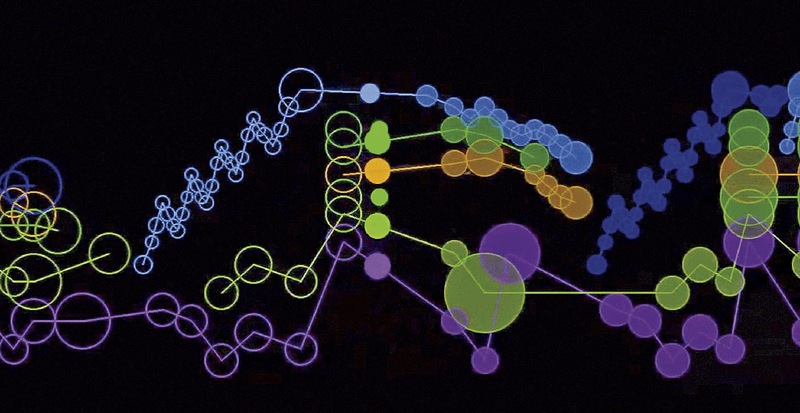 Visualizations like Stephen Malinowski’s Music Animation Machine version of Debussy’s Arabesque no. 1 for piano solo can lead to new insights into musical compositions. What do we see when we listen to music? In 1940, Walt Disney’s Fantasia famously drew Tchaikovsky’s Nutcracker Suite as dancing flowers, and Stravinsky’s The Rite of Spring as a T-rex on the rampage. Today, the music-library software preinstalled on most personal computers offers customizable options: flames, puddles of color, wheeling galaxies. Although these interpretations have artistry, they neither promise nor grant real understanding of how music works. Coasting atop the waves of sound, the images reflect little of its actual structure. But what if a tool were designed to put sight squarely in the service of sound? In creating what he calls “the quite technical interpretation of how music works and how it hangs together, we use a lot of diagrams,” Rehding explains. The academic community already shares the structure of a symphony, or a jazz pianist’s chord transformations, through dense illustrations. But when used to communicate with even a slightly wider audience, these diagrams can confuse as often as they clarify. Even the most gung-ho undergraduates become bewildered when talked through these analyses, which are challenging to reconcile with the music itself. And there’s another problem, Rehding adds: “If you try to show how the flow of the music works, then the static medium of print isn’t well-suited to a lot of the things that go on.” By contrast, a dynamic diagram can situate the listener in time; a computer model can display change in a third dimension, even rotating as necessary. The two ethnomusicologists study vastly different repertoires: Rehding focuses on nineteenth-century Germany; Monson works on jazz and the African diaspora. In her field, visual representation is a particularly fraught topic—many debate whether music that’s composed during in-the-moment performance, as jazz improvisation is, should be transcribed into Western notation at all. “We’re both interested in the sensory experience of listening, and view it as a kind of knowledge that’s not necessarily text-based,” Monson explained in August to the DARTH (Digital Arts and Humanities) Crimson group at Harvard. Digital tools could allow scholars to legibly depict their aural observations, while bypassing the score tradition. Expressing musical structures through new visualizations could also cut across the cultural biases and natural barriers presented by standard notation. Chatting before a fortepiano concert at Jordan Hall in February 2014, the pair discussed a graduate seminar Monson was attending on new techniques of musical analysis. Intrigued by the idea of bringing theory’s insights into the digital age, they set their project in motion by reaching out to colleagues knowledgeable about computer applications, including Michael Cuthbert ’98, Ph.D. ’06, an associate professor at MIT. While a fellow at the Radcliffe Institute from 2012-2013, Cuthbert had created an open-source toolkit for analyzing musical scores, and used it to examine more than 2,000 medieval French, Italian, and Spanish works.